During a research project carried out by an Austrian historian professor who was seeking historical records about Archduke Ferdinand II, former regent of Tyrol, he stumbled across some interesting material on a conjuror named Hieronymus Scotto. It appears that Scotto had enjoyed the Archduke’s favour and privileges at court. Not a great deal is known about Scotto whose career spanned the latter part of the 16th century and his magic and juggling activities took place from 1569 till 1610. It is known that he was born in the city of Piacenza in Northern Italy but the exact date cannot be confirmed. He was also known under the name of Girolamo Scoto and Hieronimi Scotti. Hieronymus Scotto travelled extensively throughout Europe and performed for the aristocracy and crowned heads of state with his ‘deceptions in black art’. He became known as the Knight of Piacenza and was also known as Count Albertos Scotos but mystery surrounded his alleged high born origin. It is known that he indeed found favour and acceptance in the courts of Austria, Germany and France and may have done all sorts of secret political business for the rulers of different countries . As proof of his place in the history of magic, Hieronymus Scotto became the first known conjuror of the Renaissance period. In 1569 he received a gift of 100 Gulden (The ancient term for gold coins used in Germany and Holland) from the Archduke and 3 years later performed for Ferdinand and his family with a performance of card tricks. 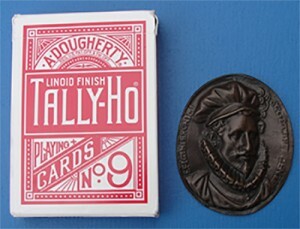 A description of his card tricks was recorded by the Archdukes personal physician, Dr Handsch who was greatly surprised at the conjurors clever skill and adroitness. “I thought of a card“ he writes, “The 8 of hearts and he immediately showed it to me. Ten other persons present were invited to remember a card; Scotto had cards drawn and what a miracle, each one drew the card he was thinking of”. He also put four cards into ones hand asking, “What do you want, 4 Kings, 4 queens or 4 jacks”? And lo whatever you wanted they appeared. Her Grace (Philippine the Archdukes consort) ordered a heap of different coins be put on the table. The coin she merely thought of, he found it. This was repeated for the Archduke who thought of a bent Kreutzer piece and he found it. 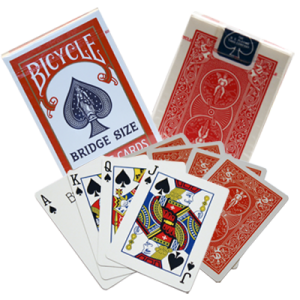 When he repeated the trick with the 4 cards, one gentleman tried to embarrass Scotto by answering, “Nothing”. When the 4 cards were shown they were indeed all blank. The doctor was invited to think of one piece in a food dish of various ingredients and he thought of a craw-fish claw and the performer immediately pointed to it with a knife. “Truly this is no small matter“, remarked the amazed and bewildered doctor. A chamberlain employed by the Archduke was asked to select a phrase from a book and to note the weight of a metal scale weight which the court apothecary (pharmacist) had provided. then to everyone’s amazement and surprise, the wonder worker divined both successfully. Further wonderment was created when The Archduke in a separate room wrote something down that was immediately written by Hieronymus in another room simultaneously. As the acclaimed magician / writer Ottokar Fischer noted, “Was Scotto perhaps the first mentalist in history”? Scotto was known as a clever card manipulator but perhaps he was also a clever telepathist and thought reader as well! It was recorded that Hieronymus Scotto performed for Queen Elizabeth 1st of England in 1602. Earlier in 1599 King James 1st wrote three books titled “Daemonologie” that not only discussed ‘Magie and Neocromancie’ as he termed it but he firmly believed that it was the work of the devil and evil spirits and condemned it all. He also believed that much of what the roving Jonglers and magicians did was evil that included the work of astrologers, spell casters, soothsayers and witches. Around this time Reginald Scot had written the very first book in English titled, “The Discoverie of Witchcraft” that became the forerunner of other books dedicated to explain away the myths surrounding witchcraft by exposing the methods used by conjurors were merely entertainment skills. King James firmly believed that this was still the work of the devil and were not good for his superstitious subjects, so he ordered all found copies of the book be burned. 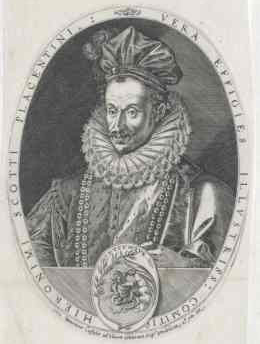 King James was a scholarly king and made mention of Hieronymus Scotto in his “Daemonologie books” casting him in a most unfavourable light. Later King James was to rewrite the bible that then became the accepted and official English Protestant biblical text. In the year 1580, the Italian sculptor Antonio Abondio struck a special bronze medallion when Scotto was performing for Rudolph 2nd of Bohemia (Formerly known as the Czech Kingdom) to acknowledge him as a special entertainer. Scotto took a piece of bread that he formed into a bread like medallion, whereupon it suddenly changed into the actual bronze medallion. 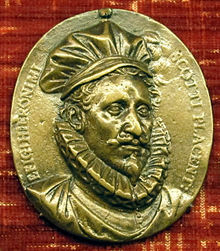 Soon afterwards, Hieronymus had a gold medallion copy cast that he used in his performances. It is probably the very first magician effigy known to us. No further records have been found regarding his life or performances after 1610 but Hieronymus Scotto has been acknowledged by the Magic Hall of Fame of America as indeed a person worthy of acknowledgement in the history of magic. The portrait of this early performer is held in the National Archives of the Austrian State Library and he indeed looks like a person who would endear himself to royalty and the aristocratic society that he indeed did.